About 16 years ago, long before ESXi and vSphere, VMware published their first product: VMware 1.0. 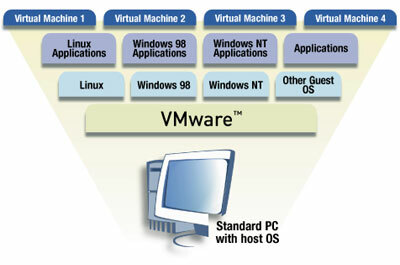 VMware was the first application that allowed to run multiple operating systems on a single x86 machine. The VMware Virtual Platform technology adds a thin software layer that allows multiple guest operating systems to run concurrently on a single standard PC. The first product "VMware" is still available today, but known as VMware Workstation. 1999-05-15 - VMware 1.0 - Supports up to 2GB of Memory. I've created a new page with a full VMware Workstation Release and Build Number History. VMware 1.0 requires a Pentium II 266MHz processor and 64 MB of memory. Virtual Machines with up to 2 GB of memory are supported. 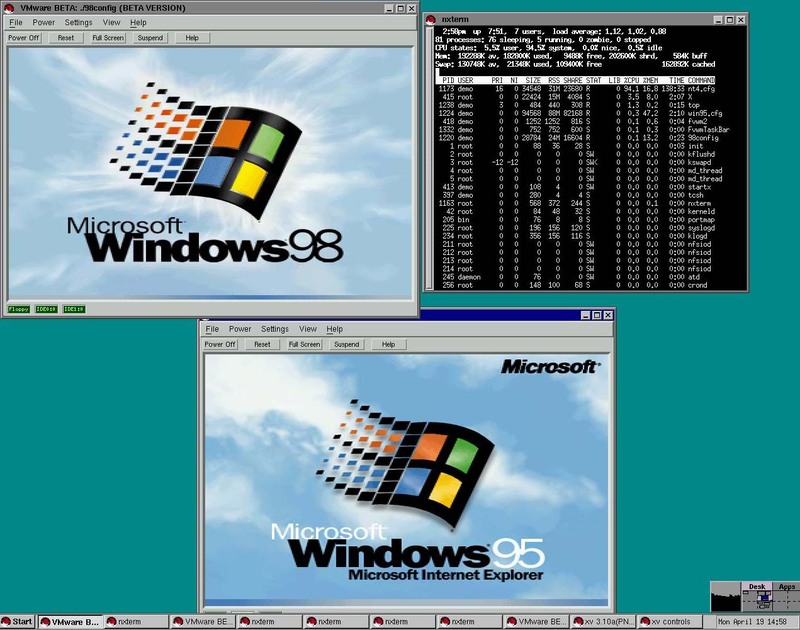 VMware 1.0 was able to run virtual instances MS-DOS 6, Windows 95/98, Windows NT, Red Hat 5.0, SuSE Linux 5.3 and FreeBSD 2.2.8, 3.0, and 3.1. VMware 2.0 supports "Suspend and Instant Restore" which allows you to save the virtual machine to disk, allowing you to instantly restore the state of your machine without having to reboot. It also introduces the ability to shrink virtual disks and uses bridged and host-only networking to connect the VM to the network. VMware Workstation 3.0 introduces a "Repeatable Resume Feature" which allows you to resume a VM from a specific point at which it has been suspended, over and over. With support for Remote Desktop it is possible to connect remotely to the host to remotely manage VMs. The support for guest operating systems was extended to Windows XP/2000, Netware 6.0 and recent Linux versions. VMware Workstation 4.0 supports PAE for host and guest operating systems, USB 2.0, DirectDraw and Snapshots. Snapshots can be created at any time, whether it's powered on, powered off or suspended, and you can revert to the snapshot anytime. Version 4.0 also introduces Drag and drop for file transfer and shared folders. VMware Workstation 5.0 enhances the snapshot functionality by allowing you to take an unlimited number of point-in-time, saved-to-disk snapshots of running VMs. The introduces cloning functionality allows it to copy virtual machines and share them. Full and linked clones are supported. VMware Workstation 6.0 enhances desktop and server capabilities by introducing multiple monitor support and VMs can run in the background. Also included in this release is the Converter Import wizard from the VMware Converter product which allows to convert physical Windows machines into VMs. The Virtual Machine Communication Interface (VMCI) provides a communication API for applications running on the host and in virtual machines. VMware Workstation 7.0 introduces a new Windows Display Driver Model (WDDM) which can display the Windows Aero user interface, OpenGL 1.4, and Shader Model 3.0. It comes with vSphere 4.0 and ESX support to allow the installation of virtual ESX host instances. Virtual machines with up to 4 vCPU and 32 GB of memory are supported. VMware Workstation 8.0 was the first release that requires a modern 64-bit CPU. By enabling Virtual VT-X/EPT or AMD-V/RVI for virtual machines you can run 64-bit guest operating systems inside of vSphere running inside Workstation. It also supports USB 3.0 and allows to automatically start virtual machines in the background. A new remote connection feature allows you to connect to remote hosts running Workstation or ESX 4. VMware Workstation 9.0 comes with WSX, a web interface that enables users to access their Shared virtual machines via a web browser. Enhancements for nested virtualization allows users to run ESX as a guest OS and run a 64-bit operating system nested in ESX using less system resources. Experimental support for Hyper-V was added. VMware Workstation 10.0 introduces tablet sensors, a virtual Accelerometer, Gyroscope, Compass and Ambient Light sensor. Virtual Machines with 16 vCPU and 8 Terabyte Disks are supported. The SSD Pass-through feature allows the guest operating system to detect when the virtual machine Disk file is being stored on an SSD drive and the operating system can make the same optimizations when it is running in a virtual machine. VMware Workstation 11.0 supports high resolution displays such as the new QHD+ (3200x1800) displays used in laptops and x86 tablets. A vCloud Air integration enables you to extend and scale virtual machines to an external cloud. You can also boot virtual machines with EFI support. VMware Workstation 12.0 adds support for Windows 10. Graphics support has been added for DirectX 10 and OpenGL 3.3. Support for IPv6 NAT networking and 4K monitors has been added.